Professor Emeritus of Forestry Harold F. Heady passed away at the age of 95 on April 28, 2011 in La Grande, Ore.
Heady was a range management ecologist at the University of California, Berkeley from 1951 to 1984, and in 1991 was awarded the Berkeley Citation for his extraordinary contributions to the University and his field. 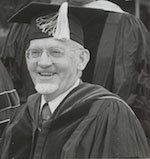 After the schools of agriculture and forestry merged in 1974 to form the College of Natural Resources, Heady served as CNR’s associate dean of student affairs from 1974 to 1977. He also held numerous senior administrative positions at the University of California, including director of wildland resources, assistant vice-president for agriculture and university services, and associate director of the California Agricultural Experiment Station. Heady also lived in an era of less red tape. “As the Dean of Student Affairs in the CNR, he listened to this young potential student talk about what she wanted to do with her life,” said Allen-Diaz, who also serves as the associate vice-president of UC's Division of Agriculture and Natural Resources. “He asked lots of critical questions and provided information on the field of range management. Three days later, I was enrolled as a graduate student in range management and have had a long and productive career. It was because Harold was willing to listen and willing to take a risk that made the difference in my life. I will miss him dearly,” she said. Heady authored or co-authored more than 160 publications in the field of ecology and natural resource management of grasslands and shrublands, including the textbook Range Management(1975, McGraw Hill). He won numerous awards, including a Guggenheim Fellowship and two Fulbrights, and spent many years living and conducting research in Africa, Australia, Russia, China, and Saudi Arabia. He helped form the Society for Range Management in 1946, serving as its first treasurer and in 1980 as its president. Allen-Diaz said Heady was fun loving and an avid hunter, regularly providing his delicious home-made venison sausage at various range barbeques. “He was also an incredible artist, famous for his pen and ink sketches of grasses and other rangeland plants," she said. Harold F. Heady was born in Buhl, Idaho on March 29, 1916. He earned a B.A. in forestry and range management from the University of Idaho in 1938, a master’s in forest botany and ecology from the New York State College of Forestry in Syracuse, N.Y., in 1940, and a Ph.D. in plant ecology from the university of Nebraska in 1949. Before joining the Berkeley faculty in 1951, Heady taught at Montana State University and Texas A&M. Heady retired from UC Berkeley in 1984 and resided in his Berkeley home until he moved to La Grande, Ore., in March 2005. His family said that in addition to hunting he also loved fishing and always tried to balance nature with a contemporary lifestyle. He was a veteran of the United States Navy. He set up residency at Grand Ronde retirement home, where, he enjoyed playing cribbage and poker, visiting a local elk farm, taking bus rides to the Blue Mountains, and spending time with his many close friends. Heady was preceded in death by Eleanor (Butler) in 1979 and second wife Ruth (Atkinson) in 2001. He leaves behind his daughter Carol DeMaria of Longview, Wash.; his son Kent Heady and wife Celia of Dale, Ore.; three grandchildren; and four great-grandchildren. A remembrance ceremony will be held for him this summer at a family reunion.